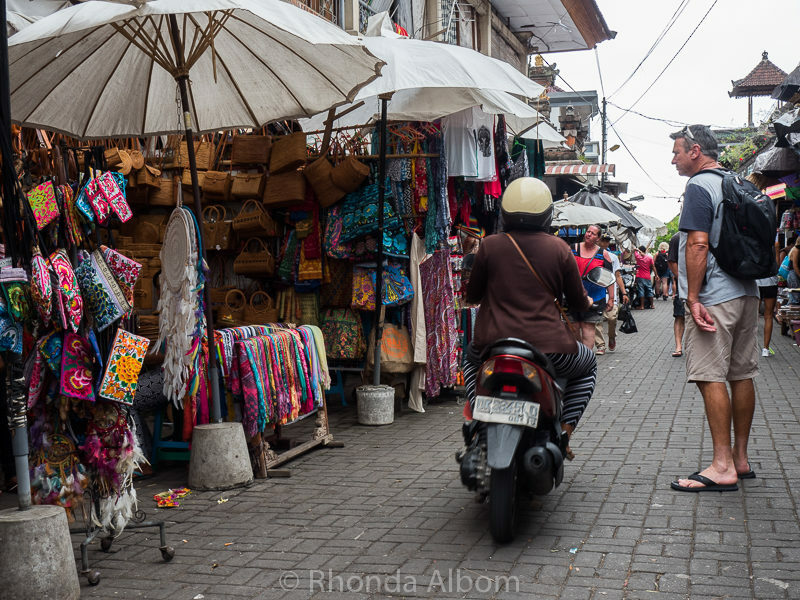 One day in exotic Bali is not enough, but as a cruise port, that was all we had. There are two basic choices for a Bali itinerary. 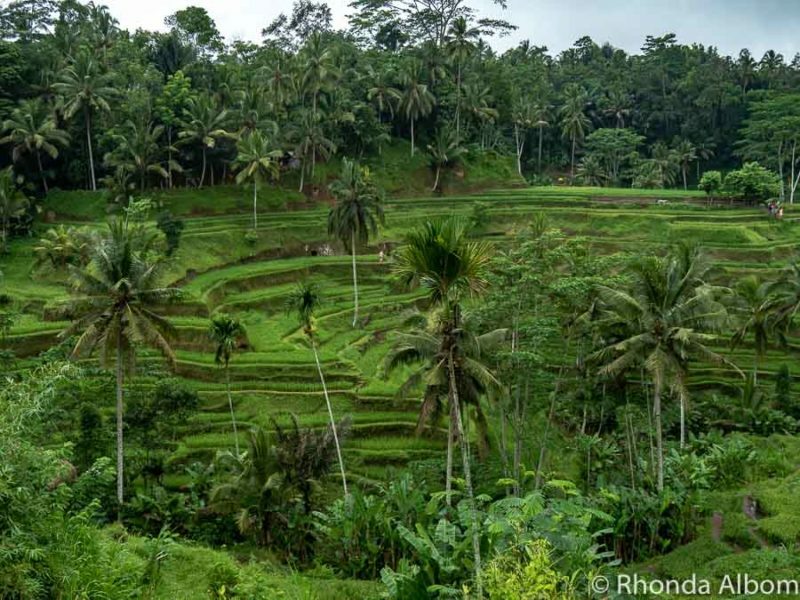 We could head inland to Ubud and see the rice terraces, monkey forest, and markets. Or we could simplify our Bali itinerary to a day at the beach. 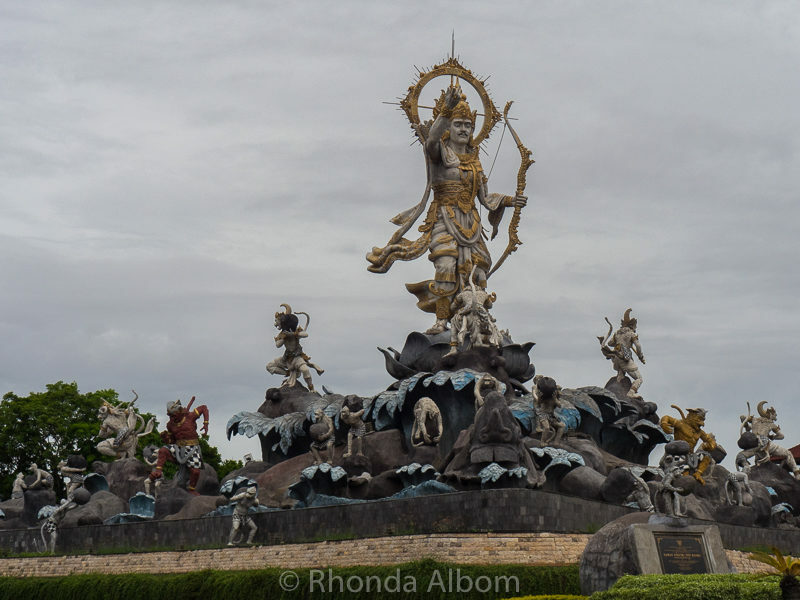 Our day was overcast and rainy so the decision as to which things to do in Bali was easy. However, even in the rain, the island of Bali is intriguing. We docked in Benoa at the Bali cruise port. From here, we hired a Bali private driver to show us the sites. We were lucky that our driver spoke English, and loved talking about his island nation. Typically, we hire a private guide in advance when we have one day in a port. 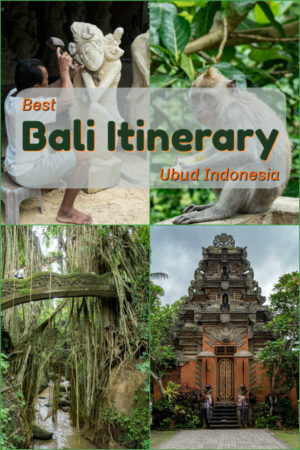 Below are our highlights of the best things to do in Ubud Bali. 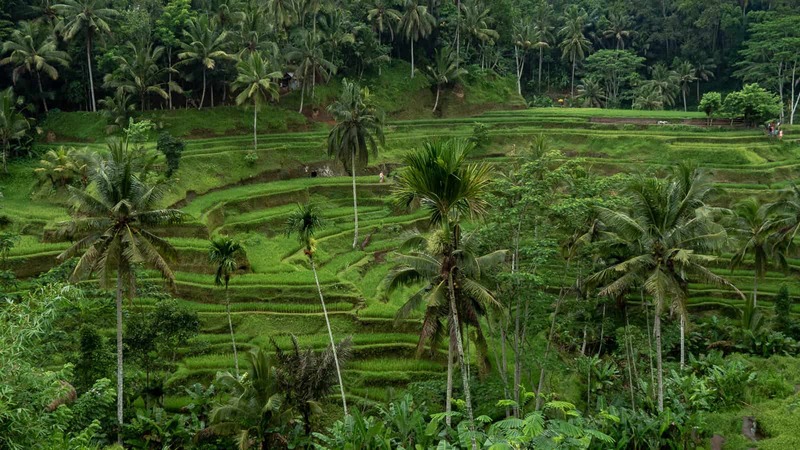 The famous Tegalalang rice terrace is one of the top two destinations on my things to do in Ubud list. 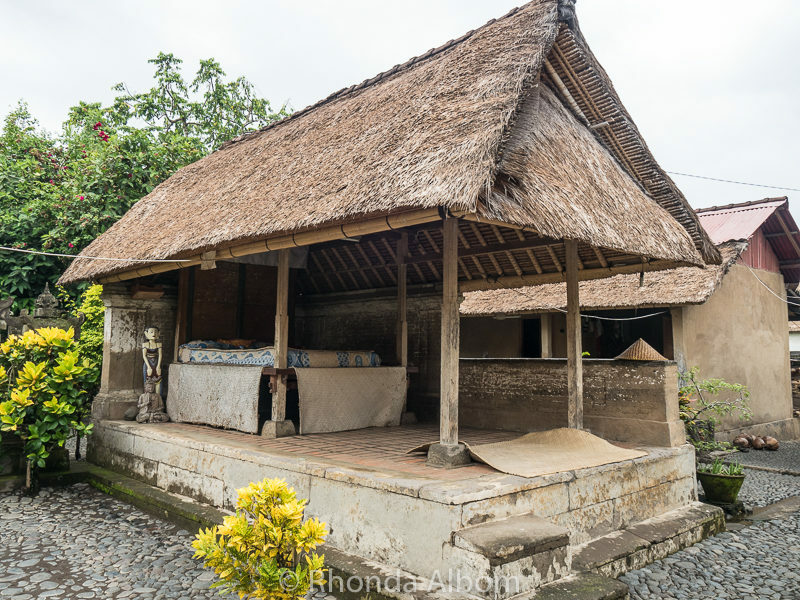 Located just north of Ubud in the Tegalalang village, they are a scene out of the movie Eat, Pray, Love (actually filmed here). Even in the rain, the dramatic views are timeless, stretching endlessly. 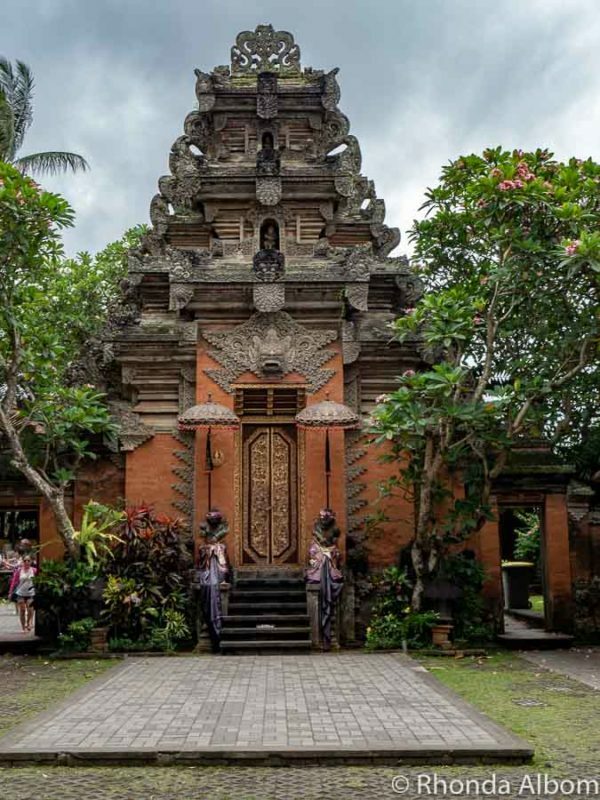 If Elizabeth Gilbert’s Eat Pray Love changed your life, you’ll want to check out this top rated ⇒ Bali Eat Pray Love tour. Tegalalang rice terraces, beautiful even in the rain. 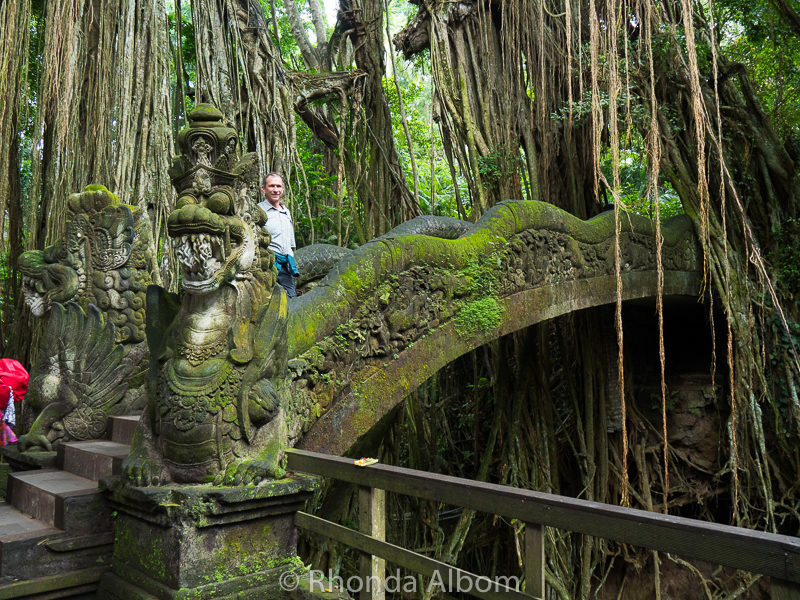 The Sacred Monkey Forest Sanctuary in Ubud is a highlight of our day. The cost of entry was nominal and worth it. The wild monkeys are seemingly everywhere. Many visitors let them climb on their shoulders for photos. We are a bit more cautious around wild animals, especially knowing that these monkeys do sometimes bite visitors. Even unprovoked monkey bites happen. In fact, we had one monkey jump up and try to bite something attached to our backpack. It could have just as easily been an arm or leg. It is a good reminder to us to always carry travel insurance when we leave our home country. Our current favourite company is World Nomads as they will give a quote even once travel has already started. 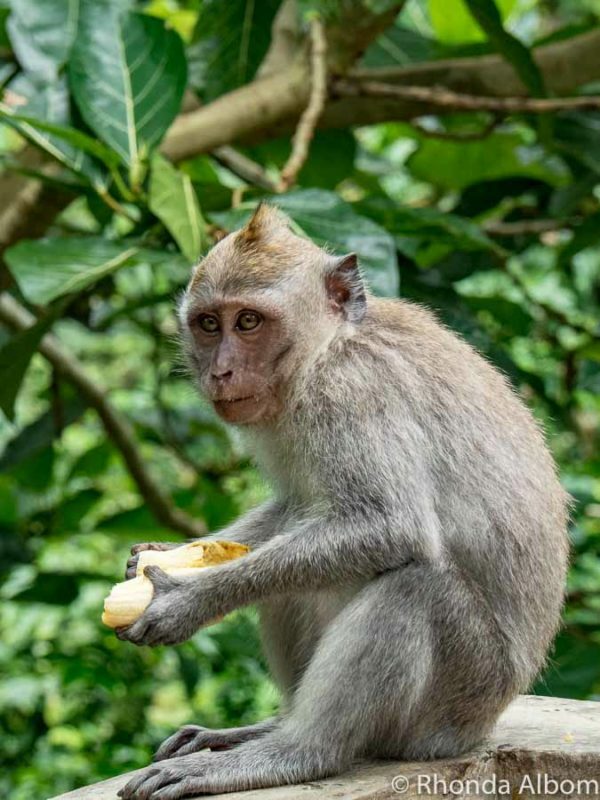 TIP: Don’t bring food, water bottles, or have anything hanging from your backpack when you go into the monkey forest, as monkey’s stealing food from visitors is one of the top ways in which people get bit. One of the nearly 600 monkeys in the Ubud Monkey Forest. Jeff is standing on this amazing bridge in the monkey sanctuary. Pura Dalem Agung is one of three Hindu temples in the monkey forest. All three had monkeys climbing on them. 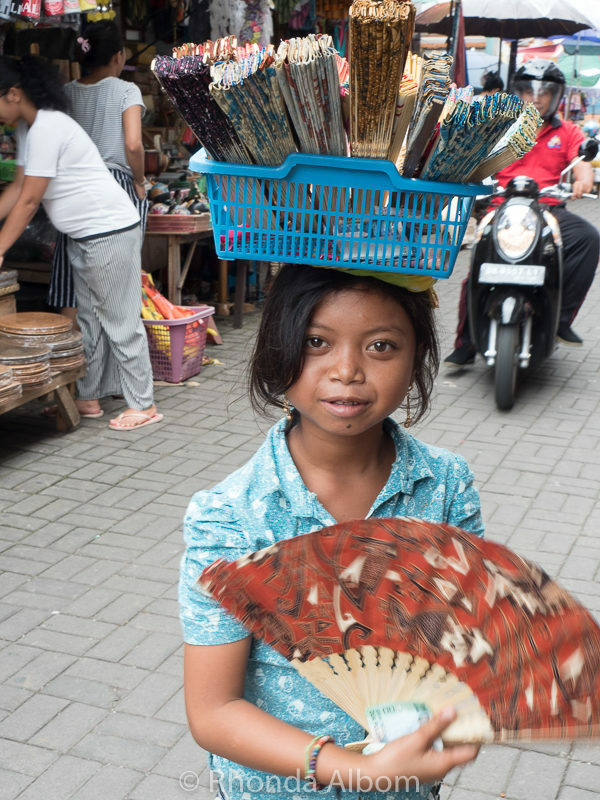 Crafts, food, clothes, and great coffee are the key things we found in the Ubud Central market. We also bought some fresh papaya and delicious ice cream. When a scooter whizzed past us in the crowded market, we had a deja vu moment back to our time in Marrakesh. I bought a fan from this girl. She was an excellent negotiator. We also visited a traditional Balinese house complex. They have at least four pavilions: for cooking, ceremony, sleeping and a family temple. This one had more, and there were several people currently living there. It is government sponsored and from what I understood, part of their agreement is to allow visitors. Per our guide’s recommendation, we made a small donation when we left. Another pavilion of the house. Once the official residence of the royal family, today the historic Puri Saren Agung is a place to enjoy in daytime or, listen to music in the evening. It’s free to enter and located near the market. Puri Saren Agung is the Palace in Ubud. Of course, this giant sculpture in the middle of a major street would be difficult to miss. It tells the Hindu story. While most of Indonesia is Muslim, the island of Bali is predominantly Hindu. 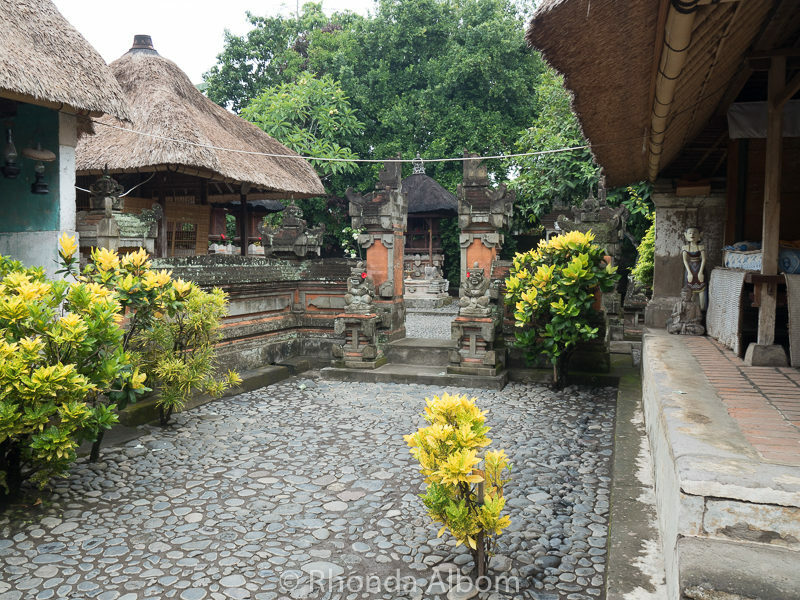 As we left Ubud, heading back towards the Bali cruise port, we stopped at Bali Batuan Temple. At nearly 1,000 years old, it is a stunning example of Balinese ornamental design. 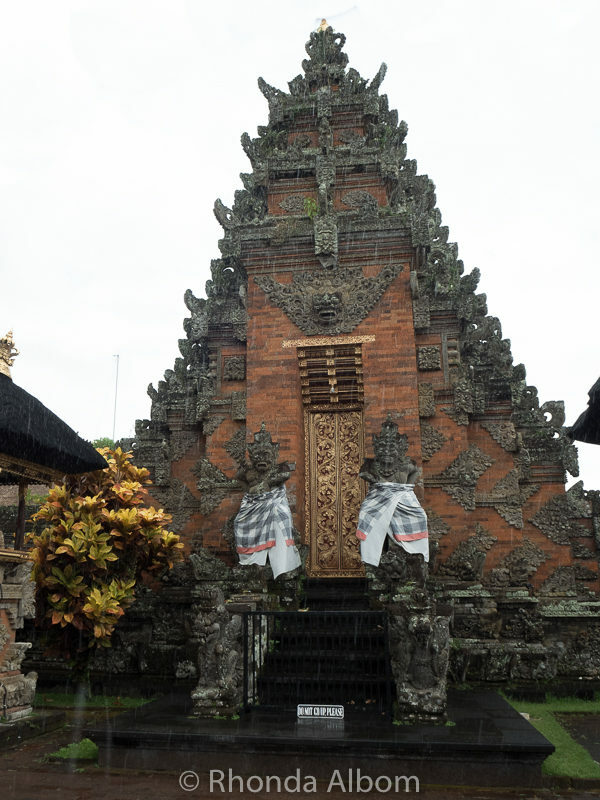 The temple is looked after by the artists and craftsmen of the village of Batuan. 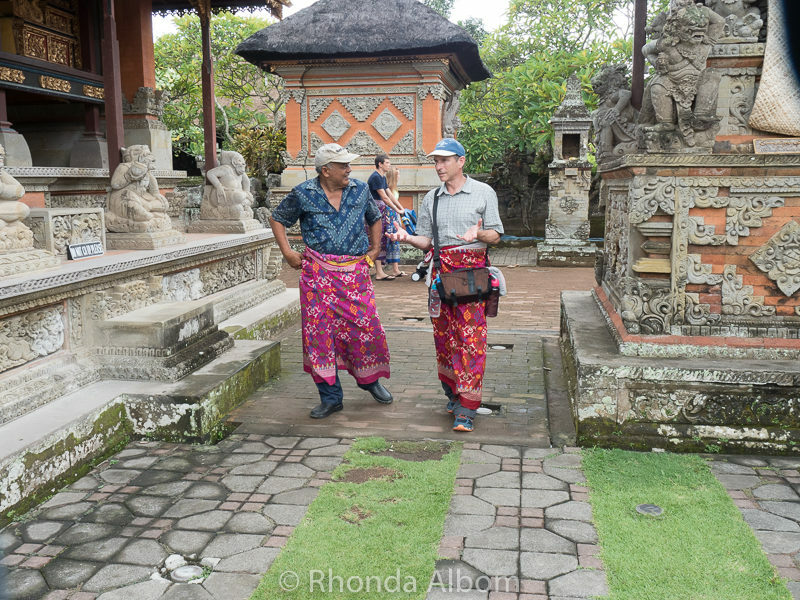 Before entering Batuan Temple, we each had to don a sarong, supplied with our entry fee. This is Jeff with our driver in Bataun Temple. Step off the main roads, or just look out the windows as you drive. Everyday life is different from what we see at the tourist destinations. Scooters waiting for the light to change. I don’t know the statistics, but it sure feels like there are more scooters than cars. A woman putting out the daily offering. It is a Hindu tradition that is done by nearly everyone. Even our driver had an offering in the car. 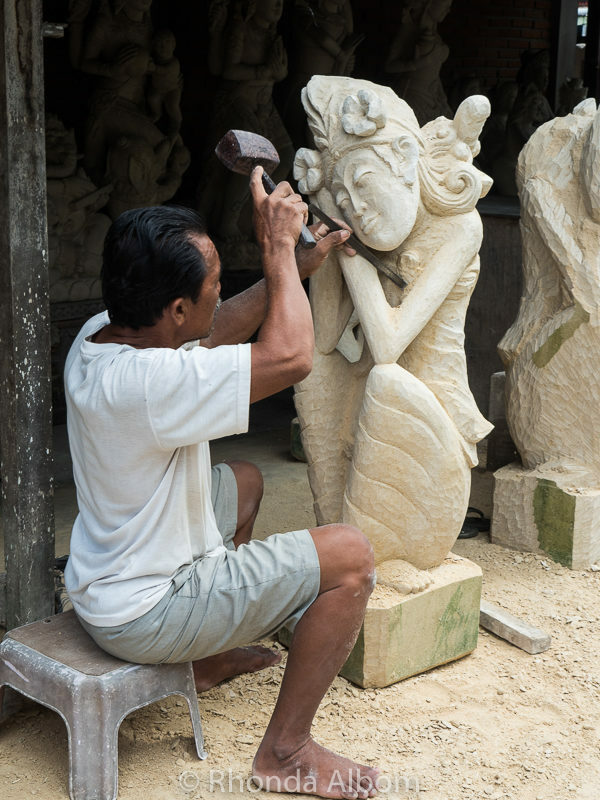 Stone carving in the village of Batubulan. Our driver explained that each village has a speciality. This town specialises in stone carving and there is shop after shop featuring similar items. Most are for export. The next village features wood carving and the next painting. There are more than 17,000 islands in Indonesia, Bali is only one of them. 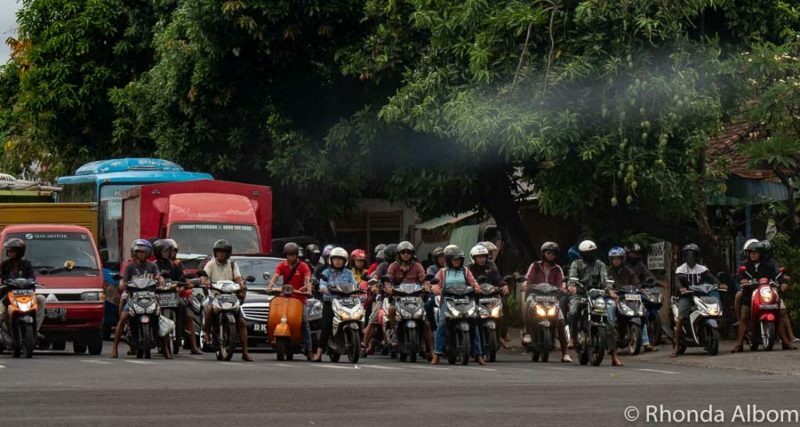 Bali has a population of 4 million, and our driver estimates that there are 2 million scooters. Tourism is the largest industry. Bali is also known for stone and wood carvings, Batik, and silver jewellery. We sailed from Sydney to Perth around the top side of Australia on the Radiance of the Seas, a mid-sized ship in Royal Caribbean family. Bali was our fourth port, having just been to Darwin Australia. From here, we headed back to Australia, this time to Port Hedlands. If you are cruising, be sure to have a look at these cruising tips. What will be on your Bali itinerary? I was just talking to a friend today about going to Bali. He went there last year and is in awe of it. Now I can see why. They have so exquisite temples, such beautiful scenery and a very exotic culture. Hiring a private driver to take you around was very wise. I would have done the same. I would have never thought that the Monkeys would get close enough to the people to steal things from their bags! That’s too funny! 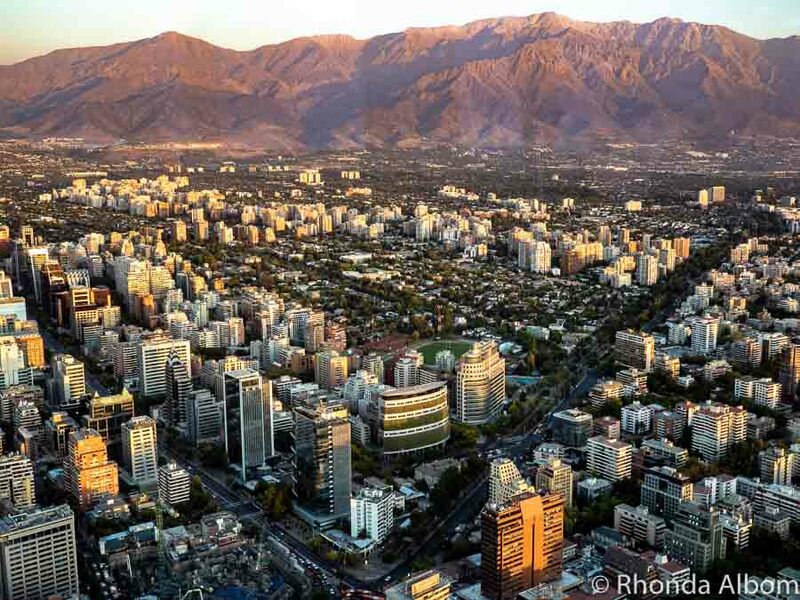 also these pictures are gorgeous and make me want to book a flight ASAP! Bali is SO beautiful. I never have been but have seen so much about it. Really wouldn’t mind at all if I got semi-lost. I wish I had visited Bali when I lived in Perth. It was so close. That was pretty amazing photography there Rhonda. And what a spectacular place to visit. It certainly looks exotic and incredible! I love the rice terrace photo – stunning! LOL – The only problem would be that all your belongings would still be onboard. The only time that I’ve been to Bali, it was at the end of a whirlwind trip around SE Asia almost 20 years ago. We were so exhausted from our travels, that all we saw of Bali was the beach in front of our hotel. I’d love to return, but hubby (who also visited as a child) says twice was enough for him. You were very wise to hire a private driver instead of joining the group tour that I’m sure the cruise offered as a port excursion. Those rice terraces and that photo of the bridge in the monkey forest make me want to return some day and explore Bali further. I spent 10 days traveling around Bali and absolutely loved it! It’s so beautiful and everyone is so nice. Yes, some places can be touristy, but I never found it to really be an issue. I’d love to go back one day and explore some of the other islands in Indonesia. 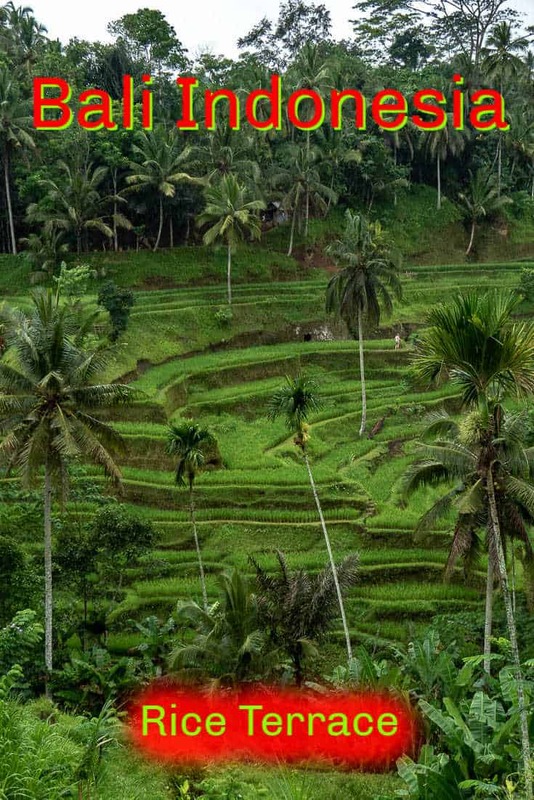 I like Ubud a lot, but then I do like all of Bali. Great shots. I have not tried yoga, but I think it’s about time I did. Great photos, love the shot of the dragon bridge at the monkey sanctuary and that baby monkey is super cute. We have never been to Bali it looks like an awesome place for a photographer. We look forward to visiting such a beautiful place. These photos are awesome! I am loving these rice terraces. I am going to Bali myself in March and can’t wait to experience it all. It just looks spectacular! I love Bali in the rain! 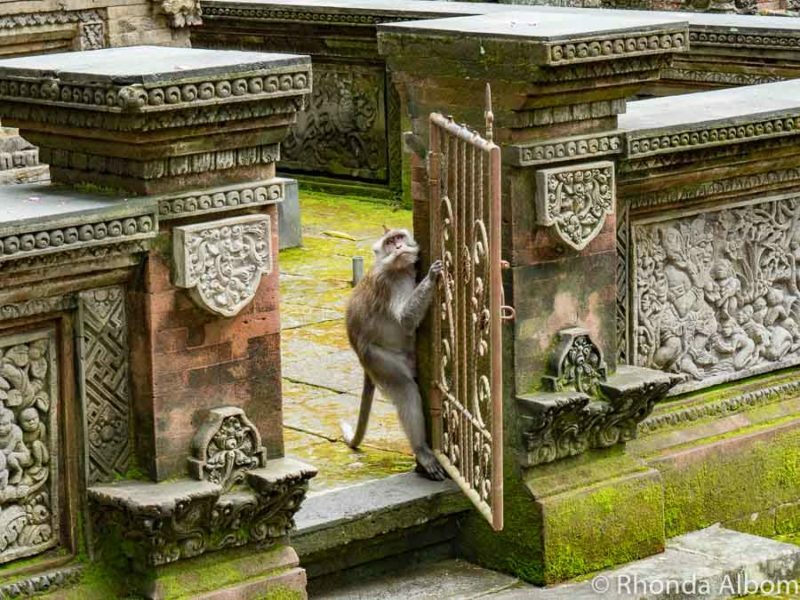 that stone carving is fantastic and the photo you’ve taken of the bridge is the Monkey Forest is wonderful. I’d love to return to Bali some day. We’ve been to Bali twice and really love it. I think you chose well. The beaches are lovely, but they’re still beaches. The monkeys and rice paddies and temples and the town of Ubud are really unique and worth spending time on. I hope to visit Indonesia someday in the future. I think the rain enhanced the green of the rice terraces making them even more spectacular. You certainly managed to see and do a lot in your day! I agree that hiring a car and driver is such a great way to get around, especially if you are pressed for time. And how cute are those monkeys?! Hope you’re enjoying your cruise! We didn’t get as far away from the crowds as we would have liked. Actually, just about everywhere we went was quite touristy, I just manage to take photos to look a bit empty. I’ve been to Ubud but I wouldn’t mind going back. I loved Bali. Wow! The Monkey Temple looks amazing! 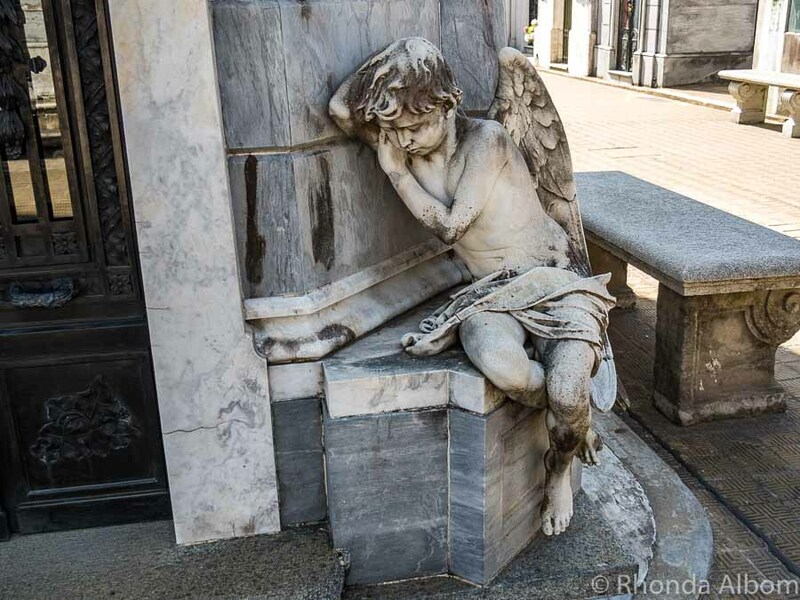 Beautiful photos Rhonda – and it looks like you had a good day exploring. The monkeys are always a highlight and I think everyone that visits Bali remembers the Hindu sculpture in the middle of the road too! Love Bali although the rest of Indonesia fares better on my list. It’s such a diverse country!! Bali looks exotic for sure. I’d love to visit it more in depth, but I believe a day gave you a pretty good idea about this part of the world. I am not particularly fond of monkeys, although I find them very interesting creatures. It’s a good idea not to touch them, or any other wild animal by this token. As cute as they may look, they may bite and transmit a lot of diseases. Exactly how I felt about them. One jumped up and bit the rolled up towel Jeff was carrying, so you really never know what they will do. Not touching the monkeys sounds like a good idea. Do they have rabies in Bali? David and I have never been to Bali but we’re thinking about it. I like the idea of hiring a driver to show you around. Yes, they have rabies in Bali. We saw a billboard about it while we were driving. Our driver assured us the monkeys are fine, but why risk it? LOL – I know that old feeling, it happens to me frequently, especially when I am scrolling down a list to find my the year of my birth. I have no idea what it was like then, but now it is a paradise. I sure am inspired to go back. Oddly, Indonesia was never on my radar before, but now it has moved quite high on the list. You did well to see what you saw in the time a cruise ship is in port Rhonda, well done. Loved your photos as always. That’s because we hired a private driver to take us where we wanted to go. I’m thinking Bali is a tourist trap, but it looks nice! Parts of it definitely are, especially the markets just outside the port where the ship docks. I would love to visit there. Wow, such wonderful adventures to be experienced. I must be one of the few Australians that haven’t been to Bali. It usually brings to mind beaches full of drunk Australians, so it was nice to see a different side. The terraces always look so magical, plus that bridge photo is wonderful. Would definitely like to see this side of Bali when I do eventually go. LOL – Yes it did seem that most tourists we encountered were from Australia. We avoided the beaches only because of the limited time and the rain. Beautiful! I’ve been to Indonesia, but only around Jakarta on shorter stops, which didn’t inspire me to stay longer. Someday I need to get out of there, and over to Bali! Hubby had a microfiber towel hanging off the camera bag and a monkey bit it. Even walking through them, the rice terraces barely seemed real. Bali looks amazing! It has been on my travel wish list for a very long time and really hope to get there soon. That money sanctuary would make me feel a bit uneasy but they look adorable. Love the photos. There are plenty of staff working at the monkey sanctuary, so it didn’t make me nervous at all. If you didn’t have food, the monkey’s didn’t bother you. I enjoyed the tour of this fabulously exotic place that somehow didn’t disappoint. Wonderful! That place just seeped with nature! I was here recently. Ubud is fabulous and is definitely my favourite part of Bali. Exquisite photos.